Researchers: William B. Frank and Nikolaï M. Shapiro, Equipe de Sismologie, Institut de Physique du Globe de Paris, France; Mathilde Radiguet, Baptiste Rousset, Nathalie Cotte, and Michel Campillo, ISTerre, Université Grenoble Alpes, France; Allen L. Husker and Vladimir Kostoglodov, Instituto de Geofisica, Universidad Nacional Autonoma de Mexico. Slow slip events (i.e. slowly moving motion on a fault) have been observed by GPS and by comparing seismic and geodetic observations. A new method of aligning GPS time series on episodes of small earthquakes has revealed new slow slip events (SSEs) that generate a surface displacement that is below the noise level of typical GPS observations. These results add useful details about the spectrum of fault slip from the subtle to the sublime that can help to understand the probability of future earthquake activity along subduction zones. 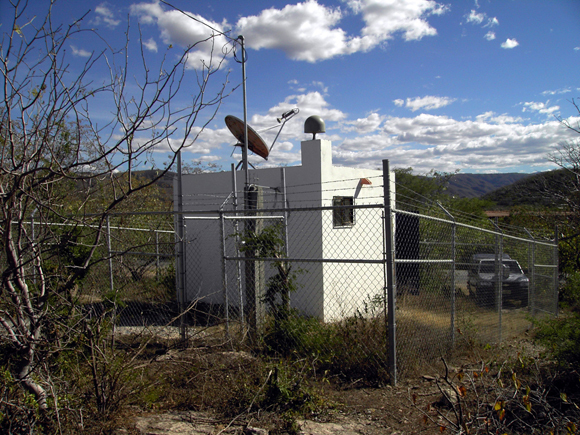 SSEs are slow movements along a fault that do not emit any seismic signal and can take hours to weeks to complete. These events repeat on a periodic basis and typically occur alongside very small low-frequency earthquakes. For example, along the Cascadia Subduction Zone, the region from 35 to 55 kilometers depth is stuck (i.e., not moving at any measurable level) for 11 to 15 months and then slowly slips over a few weeks. This slow slip has recurred more than 20 times over 20 years. It is important to recognize SSEs because it can help to explain fault dynamics and to determine whether the fault is building enough stress to potentially break in a small to large earthquake. For this study, the authors used a slow slip event that lasted for 6 months along the Guerrero segment of the Mexican subduction zone in 2006. A dense seismic network, the Meso-America Subduction Experiment (MASE), recorded almost 2 million low frequency earthquakes over 2.5 years. Seven identified swarms of low frequency earthquakes, here called episodes, that started at depth and lasted for 4 to 7 days had very similar migration patterns, so the episodes were considered repeating SSEs. Examination of the GPS data, however, did not show any obvious surface displacements during the episodes. To reveal any small surface motion hidden under the GPS noise, the GPS time series for the events were stacked together, such that any signals of the SSEs would add up and any random noise that does not add up would be reduced. The stacked GPS time series clearly show a maximum surface displacement of about 1.5 millimeters towards the south, at stations MEZC and IGUA. These tiny displacements are due to SSEs that are more than 20 times smaller than the 4 to 5 centimeters surface displacements observed during the large 2006 SSE. The smaller SSEs occur at a greater distance from the subduction trench than the larger SSEs. The smaller SSEs recur about every 3 months whereas the larger SSEs recur about every 4 years. These results confirm models of a continuum of slip modes along the subduction zone related to how much the zone might stick or slide, depending on temperature, pressure, fluids and other properties of the fault system. Identifying all of the motion along the fault will help to estimate if a larger earthquake might be getting ready to break through because of a build up of stress that is not relieved by the smaller events. 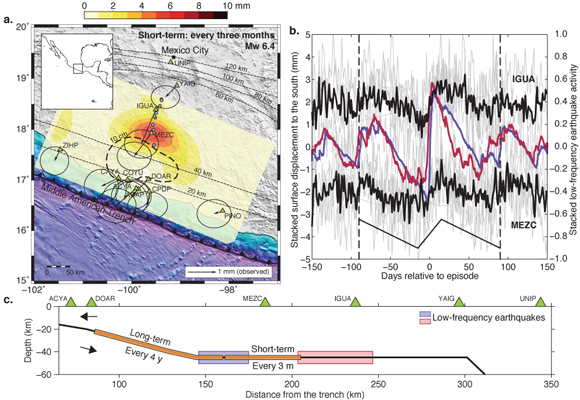 Frank, W. B., M. Radiguet, B. Rousset, N. M. Shapiro, A. L. Husker, V. Kostoglodov, N. Cotte, and M. Campillo (2015), Uncovering the geodetic signature of silent slip through repeating earthquakes, Geophys. Res. Lett., 42, doi:10.1002/2015GL063685.